This post has been a long time coming. Why? 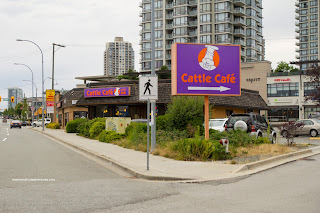 Well, I've been to this location of Cattle Cafe like 4 times in the past year and never bothered to blog about it. Call it a combination of factors such as: I didn't bring my camera, I ordered the same dish and lastly, I've blogged about 2 of their other locations already. However, much like I've stated before, not all locations of chain restaurants are made equal. It is unfair to the restaurant and potential customers that I would group all of them into one post. Hence, I finally decided to blog about it after a visit with the family. We got a couple of items to start including the XO Daikon Cake ($4.99). I order this every time because they do a pretty good job of it. 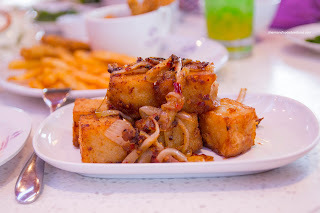 This time was no exception as the cubes of daikon cake were fried up lightly crispy on the outside while still being soft and light on the inside. There was a decent amount of daikon flavour with medium-sized slivers strewn throughout each piece. What makes this dish is the balanced spiciness of the XO sauce that the daikon cake is wok-tossed in - spicy, dried shrimpiness and savoury. 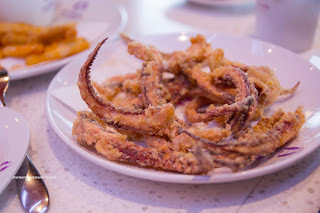 Unfortunately, the Fried Squid Tentacles ($4.99) were a bust in my opinion. They were more doughy than crispy as the batter was not light enough. Furthermore, each tentacle was very chewy, rather than the desired snap texture. For my main, I had the Laksa Mini-Hot Pot ($9.99) served with rice and condiments. I found the broth to have a decent coconut milk essence while exhibiting a medium spice level. 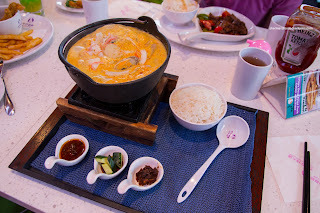 Naturally, it was not a true laksa as it was rather thin and mild, but it was not bad considering the venue. There was a good amount of ingredients including basa, shrimp, squid, imitation crab, napa cabbage, enoki and king mushroom. 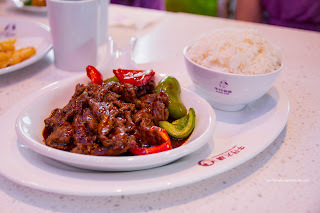 Viv had the Szechuan Beef and it was on the saltier side. However, it was meant to be eaten with plain rice, so it was okay in that respect. It was very lightly spicy (which was disappointing to her) and definitely could've used more kick. As for the beef, it was tenderized a bit too much as it was tender without much meatiness to it. My parents decided to share the Half Seafood and Pork Chop Baked Rice. As evidenced in the picture, there was no absence of sauce. The pork chop was sufficiently tender with a smooth (not tangy) and mild sauce. 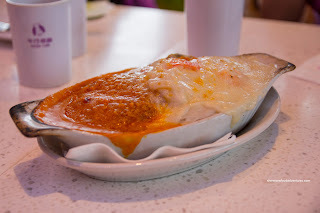 The cream sauce was more floury than creamy and mild. 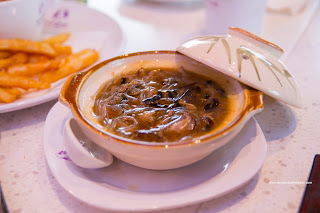 We also tried the Imitation Shark's Fin Soup which was "okay". It was more thick than silky and it was little bland. I did like the plethora of vermicelli, meat and mushrooms though. For the kiddies, they shared the Fried Pork Cutlet and Fries. We found the pork to be rather dry, but it was not chewy. It was super crispy though and not greasy. 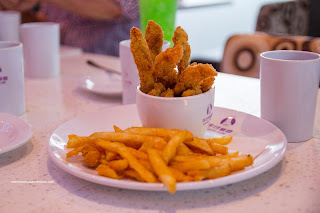 The side of starch-coated fries were light and crunchy. In the end, we were satisfied with our meals, considering the portion size and price. 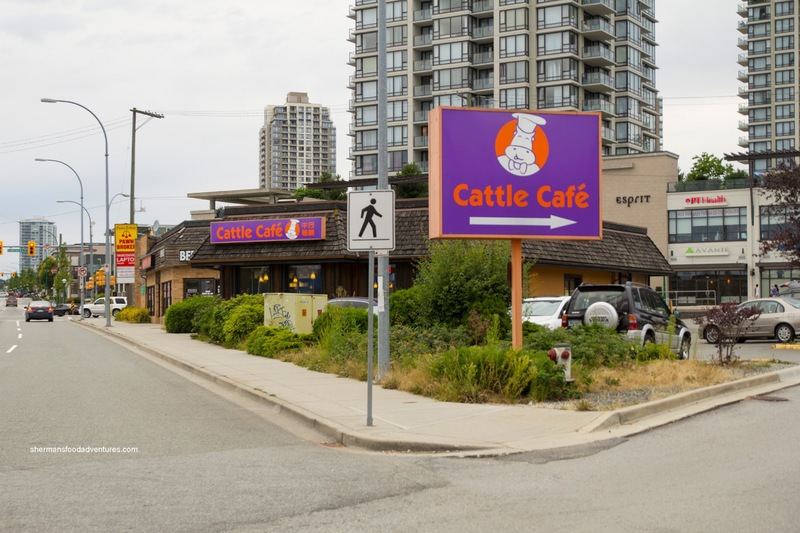 Nothing particularly amazing, yet it was consistent with other locations of Cattle Cafe. That is probably the whole point. Is that the same chain as the one further up on Kingsway beside Lao Shang Dong ? Good to see this corner revitalized, the building was vacant for a long time and became a bit of an eyesore. @LR Yup, the same one as the 2 other locations on Kingsway, next to LSD and in Vancouver, whe Da Rae Oak used to be. Oh and in Richmond too.